Cubs fans love misery Regardless of wins, everyone still shows up to see if the goat's curse will ever be lifted in Chicago. The Twins have it backwards They were playing great ball prior to 2010, but having, at best, mediocre attendance. In 2010, attendance jumped significantly. Unfortunately for them, it was also their last winning season. Despite the poor performance, attendance has remained high, presumably due to the new ballbark that opened in 2010. Maybe they should have stuck with the old digs? The Bay loves their Giants, the A's... not so much San Fran appears second from the top in terms of the team loyalty ratio. Their neighbor Oakland on the other hand appears second from the bottom – even with a better ten year win average. Florida has better things to do than baseball Despite playing really solid baseball from '08 to '13, Tampa Bay has the worst overall attendance in baseball for the last decade. They're the only team with an attendance average less than their wins average, a.k.a. their average is in the "fan dead zone". The recent relocation of the Marlins seems to have significantly boosted attendance, but prior to that, the fish had equivalently horrid attendance. Hover over individual ball to see season details. Hover over team to see all seasons for team (without details). Hover over "Show Only Averages" to plot teams' ten year averages. The scores next to the team name are a very simple, unscientific score of "fan loyalty". It is simply a ratio of mean attendance percentage to mean win percentage. It rewards teams that still have strong attendance, regardless of their wins. It especially rewards those that show up when the season is looking bleak*. 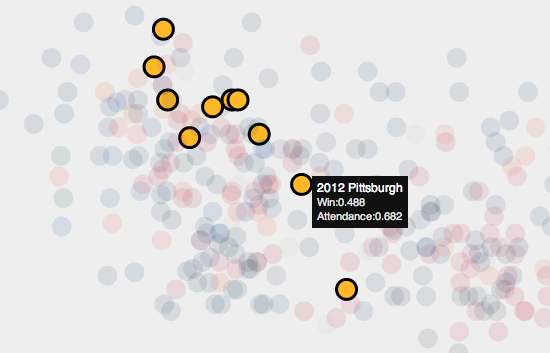 The "fan dead zone" encompasses seasons where a team's winning percentage was better than their attendance percentage. The capacity of ballparks can vary quite a bit. For example the Yankees have a 50k+ capacity stadium, whereas Boston has under 40k. You can argue those teams with larger parks are unfairly penalized by this viz. * And maybe to a fault. A plain old ratio is not ideal as it probably punishes teams with great records a bit too heavily. May replace this plain old ratio based score with more "fair" metric. // todo normalize attendance and wins for these "scores"